Your referral of your family and friends is the best compliment you could give us. We want to thank you with the EYECARE TO SHARE 20/20 Referral Program. 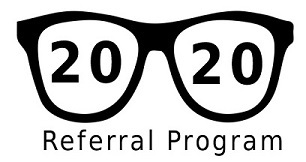 The 20/20 Referral Program is a program designed to ensure your family and friends have the same comprehensive eye care that you receive from New Optix Optometry. We want to reward our loyal patients for their trust and confidence in us and we love meeting new patients! The $20 eyewear credit can be used towards your NEXT eyewear purchase. They can be used toward your purchase of a complete pair of eyeglasses (frames and lenses), or on an annual supply of contact lenses. Credit can not be used towards services or copays. Eyewear credits do not have any monetary value. When a referred patient comes to their first appointment they MUST share with us the referring patient’s name and email address. After getting your name, we will e-mail you a $20 eyewear credit notice. Your credit will be noted in your chart and can be used for your next eyewear purchase or annual supply of contact lenses.